Indoor rowing is one of the most effective full-body, low-impact workout that you can have along with rebounding and cycling. Rowing offers a high-intensity training in a short period of time for all your major muscle groups: arms, legs, core, and back. The combination of leg presses and simultaneous rows are ideal if you are looking for a mix of cardio and strength training without the negative impact on your joints. Believe it or not, you can burn up to 800 calories per hour, which is an extremely quick and efficient way to lose weight, get in shape and tone up. Pros: Quality construction. The PM5 performance monitor is one of the best on the market for accurate and detailed training feedback. Cons: Can be a bit noisy because of the fan, but not as noisy as the Stamina Air Rower. Bottom Line: Designed by and for the professional rowers, this is an elite level machine which will offer an incredible workout. Pros: Good price/quality balance. It offers a great beginner/intermediate workout. Cons: Mostly works the upper body, little leg resistance, very noisy because of the fan. Bottom Line: Affordable, a durable machine for those people who are looking to get back in shape. Pros: Built to last, it comes with 8 levels of magnetic tension. The price is a steal for the value and the workout it provides. Cons: The display options are quite basic and not very helpful. Not suited for professional rowers. 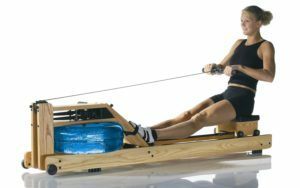 Bottom Line: This is a great machine for those people who are out of shape or have never rowed and are looking to learn more about this type of equipment. Max User Weight: 771 lbs. Pros: Made out of beautiful wood; it is quiet and sturdy. 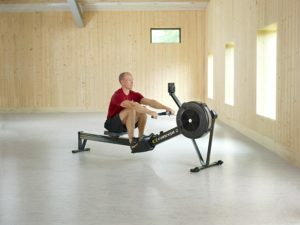 It offers the true feeling of rowing while delivering an amazing workout. Cons: The computer is a bit basic. The footrests are made of plastic and not as sturdy as expected from a machine of such quality and price. 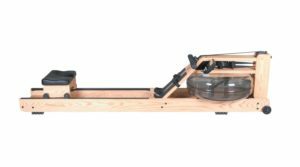 Bottom Line: A beautiful, quiet, and smooth machine which is ideal for every rower if they can afford the price tag. Pros: It comes with 12 workout programs of various levels of resistance and a backlit LCD monitor to manage and monitor your training. Very quiet machine. Cons: The chair on the Stamina Avari Rower is not the most comfortable, which can cause discomfort for some users. Bottom Line: A quality exercise machine equipped a very useful computer which will help you get (and stay) in top shape. Concept2 is renowned for building strong and durable machines that will last you a lifetime. 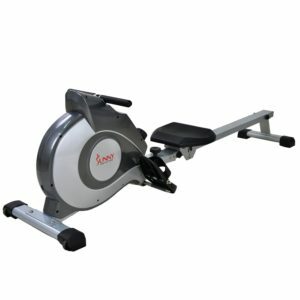 Considered to be one of the best rowing machines on the market, it has an aluminum rail capped with a stainless steel track for a very smooth seat movement. This machine uses air resistance, therefore it comes equipped with a flywheel and an adjustable spiral damper. Surprisingly, the fan attached is very quiet. The handle is ergonomic with a 10 degrees bend for a natural arm and hand position. It can be kept in the rest position near the chain guard or attached to a hook to the main body of the machine if you wish to start your exercise. The seat is comfortable and the footrests are adjustable to accommodate even the largest foot size. Model D is the largest machine on our list when assembled but it separates into two pieces for easy storage. With the help of its 2 caster wheels, you can easily move it around and relocate. You have the option to choose between a black or grey matte finishing for your Concept2. Probably one of the best things about Concept2 Model D is that you will get the latest PM5 performance monitor, one of the best on the market for accurate and detailed training feedback. The backlit monitor allows you to track important data such as distance, speed, pace, calories burned, and watts. Priced at around $950, this is probably one of the best investments you can make for your well-being. It might seem much but they are built to last decades and it provides you with the luxury of using an Olympic-level machine in the comfort of your own home for a very affordable price. This rowing machine was designed by elite-level athletes to train for their sport so you can be sure that it delivers a very effective cardiovascular workout that will increase your fitness level and tone your physique. By using air resistance you feel like you have total control over your workout. You can start slow and increase difficulty over time. The unique flywheel design and the spiral damper allow you to adjust the level of tension and resistance easily and will minimize the unwanted noise of the fan. The seat movement is equally smooth. Probably the greatest thing about this machine is the new improved PM5 monitor. 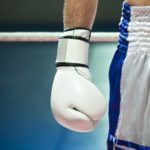 The menu is user-friendly and will allow you to select from pre-set workouts and compete against your own previous performance or online with other people from around the world. PM5 saves the data on every stroke so you can get an overview of your performance and identify areas that need improvement. You also have the option to store or transfer the data to your computer/smartphone through a USB cable or Bluetooth. In addition, you can pair the software with a compatible heart rate monitors for wireless heart rate monitoring. Similar to Concept2’s Model D, Stamina Air Rower uses wind resistance for a smooth rowing stroke instead of magnetic or water resistance. Therefore, one of the noticeable downsides is that the machine is quite noisy and less suitable for those houses where you have to keep the noise level down. On the up side, the air from the fan will cool you down during the training session. Like all the machines in this list, it is well constructed with a steel frame which folds for storage. It has floor protectors which will prevent any skidding and scratching, as well as built-in wheels for easy portability. Despite being the lightest machine on this list, it is sturdy and won’t move around during hard training sessions. One minor problem is the two pins used to fold the machine, which are hard to snap back into place when you are folding it out for use. The Stamina Air Rower has large footrests fitted with solid adjustable nylon foot straps. The seat is comfortable, padded and upholstered. The multi-function electronic performance monitor attached to the main body of the machine will display certain parameters (speed, distance, time, and calories burned) to help you track your progress, but this is nowhere near what a more expensive machine would show. The Stamina Air Rower comes with the great price tag of about $300. 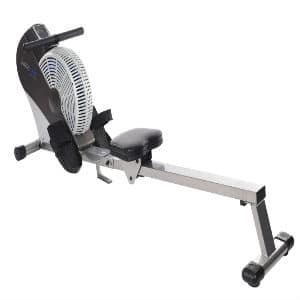 Despite being a budget rowing machine, it still providing an excellent workout for those people who would like to get back in shape and are not looking for a professional level of performance from a rowing machine. Stamina Air Rower is very similar to the WaterRower. Basically, the harder you pull, the more resistance you will get and the better the overall workout. Compared to the Concept2, it doesn’t have a spiral damper, therefore you are completely in charge of how much tension and resistance you get. The machine seems to be mostly designed for beginners and intermediate users and is great for toning all the muscles and for a good cardio exercise. On the other hand, if you are in peak shape or a competitive rower looking for an accurate rowing training then other high-end machines might be a better fit for you. Another thing we have noticed is that it mostly works the upper body as there is very little leg resistance. One way to get around this is to increase the angle of the rail which will allow you to use your body weight and your legs more at the beginning of each stroke, consequently allowing you to adhere to a better rowing form (and work your legs and back more). The seat is a bit on the small side and slippery at times and would benefit from more padding. The same critique applies to the foot boards which are a bit too small for people with a large foot size and made from a slippery material. Your feet, while securely strapped in, will still slip around a bit. At the time of this writing Stamina has more products featured on our site than any other brand. Please check out our article about the best power towers, best pilates reformer, and best mini trampoline. Sunny’s Rowing Machine is definitely built to last. 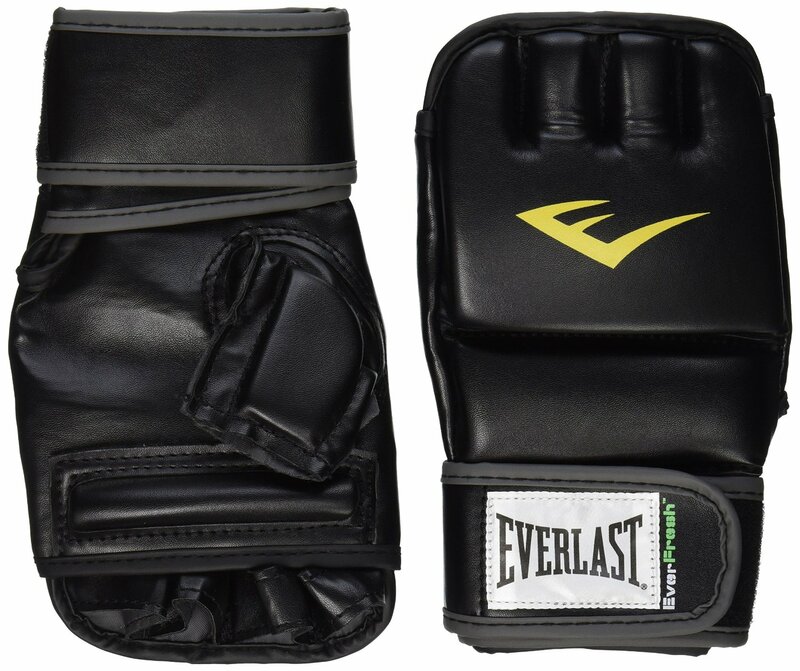 The heavy steel mainframe will withstand time and any pressure from heavy workouts. The machine comes with a smooth and quiet magnetic tension system with 8 levels of adjustable resistance. Like the Stamina Air Rower, it has floor protectors to prevent skidding and scratches and transportation wheels which will make it easy to move it around your house and to store it in your preferred location. It folds and it will save you a lot of space. The seat is fully padded and comfortable, the handlebars have a non-slip grip and the seat rails deliver a smooth slide. Compared to other rowing machines the pedals are large, anti-slip and have adjustable foot straps that will keep your feet fairly secure. The LCD console will provide you with the time, the count and the calories burnt. Since the LCD is not backlit and quite small, some users might find it a difficult to read the information displayed. You can adjust your training level by using the convenient 8 levels tension knob from below the monitor. Priced in the $250 range this is from far the cheapest machine on our list. The overall quality of the training you will get from this machine for this price is quite amazing. There is no way you can find a better deal! This machine is ideal for beginners and intermediate users and while it offers some pretty nice resistance and workouts it won’t offer the killer exercise a professional will need. 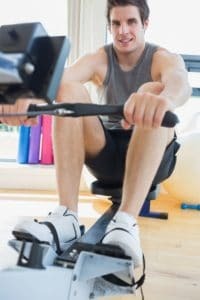 It is a great machine for those people who are out of shape or have never rowed and are looking to improve their stamina and learn more about this specific type of equipment. Despite its heavy build, it is an incredibly quiet, ideal for those houses where you need to keep the noise level down. The only thing that makes a sound is the seat as it goes back and forth. Unfortunately, Sunny’s rowing machine display options are quite basic. It does keep a stroke and calorie count (only average amounts) but it won’t display how many meters you have rowed, which is very important for improvement. 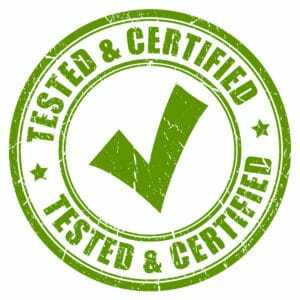 Sunny Health and Fitness has also been featured on our articles rating spin bikes. WaterRower’s Natural Rowing Machine is a beautiful piece of equipment made out of high-quality solid Ash and stained Honey Oak, finished with Danish Oil for a warm gloss. The hardwood frame offers longevity and stability to the machine. On top of this, it absorbs the sounds and vibrations of the rowing strokes, making it very smooth and quiet. WaterRower was designed to replicate the dynamics of a boat moving through water wherever you choose to exercise. 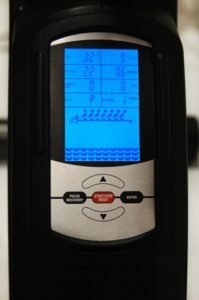 The machine is equipped with a flywheel in an enclosed water tank that mimics the sounds of the water when rowing and provides a self-regulated resistance. A Series 4 performance monitor will track the workout’s intensity, stroke rate, and heart rate. Like the frame, the belt system is smooth and quiet. We have to warn you that the WaterRower will be pretty heavy after you will fill the water tank, but the wheels attached make it easy to maneuver the machine around the room and the steady base is ideal for upright storage (the water won’t leak from the basin). The only minor problem is that the siphon pump requires a certain amount of dexterity to use. As expected from a machine of such quality the seat is very comfortable and the foot rests are adjustable for your own comfort and very easy to use. While this is the most expensive machine from this top, the price can be easily justified by the high-quality wood structure and the unique, relaxing experience provided by water. Overall, this is a solid piece of workout equipment making the over $1000 expense justified. This machine uses the water’s resistance as opposed to magnetic or air resistance. It genuinely feels like rowing on real water: the harder you row, the higher the water resistance. It is smooth thanks to the dual rail slider, much quieter than a Concept2 and way easier to fold and storage in your house despite taking out a considerable amount of space. If you are looking to get into a meditative mood while getting a good workout, this machine is ideal for you as you can listen to the pleasant swoosh of water We can assure you that it offers a phenomenal workout and it will be great even for professional rowers. The frame is long enough to accommodate even very tall rowers, with one of the most comfortable seats you will find on a rowing machine. One of the few downsides is the small computer which offers only basic functions (strokes per minute, heart rate, time, distance, and 500-meter pace) and is not backlit. This might prove disappointing for those fitness enthusiasts who need an advanced fitness tracker. Furthermore, the footrests feel a bit cheap and the straps are difficult to get just right. They have a tendency to move across your feet and will get loose over time. The fixed footrest might also put a bit of a pressure on your knees and hip joints. From the start, you will notice that The Stamina Avari Rowing Machine is made out of very sturdy materials. It has a durable steel frame which folds for easy storage and it comes with a set of attached wheels to help you carry it around your house. The machine is only 36” x 20”x 53.5” when folded, which makes it ideal for those people who don’t have much space around their apartments but are still looking for the best workout possible. The extruded aluminum rowing beam allows for very smooth movements during each stroke, and the rail has a comfortable incline which will help you maximize your workout. The handlebar is foam padded and comfortable to use for long periods of time. The leg rests are comfortable with durable Velcro straps which will hold your feet securely. In addition, the machine is equipped with an InTouch® LCD backlit Fitness Monitor and an electronic chest strap which monitors your heart rate. The monitor keeps track of time, distance, calories consumed, strokes, pulse and watt. For about $700 you will get a great deal especially if you compare this machine with more famous brands from our list. For this price, you will not only get an amazing workout but a long-lasting piece of equipment as well. Stamina Avari is a very smooth and quiet machine – you can safely use it while watching television or listening to music and you won’t disturb your neighbours. Through its Fitness Monitor, it offers 12 workouts programs of 30 minutes each with various levels of resistance. 7 of these 12 programs will automatically adjust the magnetic tension to maximize your cardiovascular workout without any interruptions. The monitor also lets you create your own routine if any of the suggested training regimens is not suitable for your needs. The multi-function panel is very easy to navigate and will give you information on your performance, your program, as well as your pulse. Whether you are just beginning or are a professional athlete, you can pick up (and adjust while training) the best combination to maximize your workout. We also noticed that the machine offers more resistance than more established brands and will work all your body muscles as needed. Despite all its good qualities we had to give this machine only 4 stars, as the seat is hard and uncomfortable. Your buttocks will start hurting after about 20 minutes making the whole experience painful. It seems like this is not an issue with all the users but it might help to buy additional cushioning if you plan to purchase it. There are very few machines on the market that can match the quality of a Concept2 Model D. Whether you are a professional athlete or a simply someone who is looking to get in shape and improve their health, this machine has everything you need for a total body workout. Concept2 is a very well-crafted machine which was designed and built with the idea that it will offer an amazing daily workout for the rest of your lifetime. 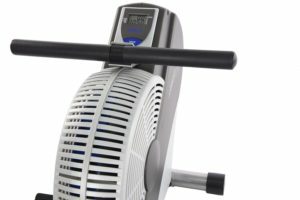 Some of you might consider it a bit pricey, but compared to other fitness machine prices (some can get as high as $2000) and gym membership prices it actually provides awesome value. The air resistance gives the user a realistic feel and you do not have to constantly adjust the resistance like with the magnetic models. It allows you to decide how hard you want to push depending on your health and fitness level. It definitely puts less pressure on your joints while still delivering the same intense workout you are used to. The adjustable performance monitor is among the best on the market and it comes with some advanced features that will help you steadily improve. Most of the rowing machines we selected are built using a variety of materials from stainless steel to aluminum and wood. Generally, the flywheel, chair, handle, and footrests are made out of plastic so we ensured that these components are durable enough and won’t break over time. On the high-end machines you will find a chain that connects the handle to the flywheel, while less expensive alternatives use a nylon band as a replacement. 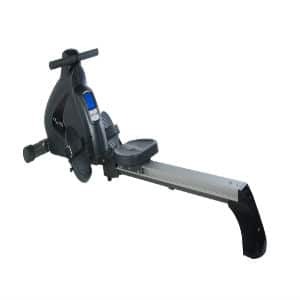 When purchasing a rowing machine it is important to look for one that is sturdy enough to withstand your weight and intense training, with a comfortable seat so you won’t hurt your lower back and solid, wide footrests with a good nylon band to secure your feet in place. Form is essential, so make sure you have enough space on the bar for a complete rowing stroke. All the machines in our list come equipped with a monitor to track your performance. 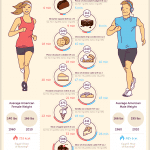 Some offer more advanced statistics while others are more basic but this is still important information that can help you improve your performance. Our top offers a selection of brands from every price category, ranging from $200 to $1200. Naturally, high-quality rowers come with a steeper price because of the materials used (e.g. wood) or the technology incorporated, but there are also great rowing machines which offer an amazing workout for only a fraction of that price. We looked specifically for those machines that balance the quality and durability of the materials with a great user experience. We tried and tested each of these machines for a full 30 minutes to see which one would offer the best workout. During the exercise session we looked out for how stable and smooth each rowing machine is, how easy it is to use it, if our body feels comfortable while being on the machine and, ultimately and the most important how much resistance we get from each of them and if it works all the body muscles as promised. We also paid special attention to the monitor and looked for key parameters like distance, strokes per minute, heart rate and calories burnt as they are a valuable tool to help you assess your progress. The noise level has been checked as well because some users share their homes. Selecting the right rowing machine can make a substantial difference to your training. 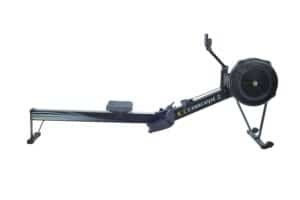 If you are just beginning and are still trying to get a hold of the rowing motion maybe it is for the best if you buy a magnetic rowing machine. 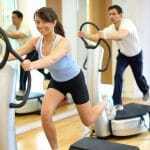 They allow you to adjust the level of resistance and progress at your own pace while achieving your fitness objectives. If, on the other hand, you love rowing and are looking for an authentic feel and more control over your own exercises then an air/ water resistance based rowing machine might be better for you. Quality materials for the chair, footrests, the flywheel, and the chain can also make a huge difference on how often you choose to use the machine and how effective the workout is. These components are also the ones that need to be replaced more often and can cost a pretty penny. A quality rowing machine will come with a good monitor who tracks your performance. Basic parameters are a must if you need for example to lose weight, reduce your blood pressure or achieve a certain level of performance for your next competition. We included at least one example of each in our top to help you make the best choice. The air resistance models use a flywheel with fan-like air-fins to create resistance. This is why the faster you spin the wheel, the more resistance you get. The water resistance models work in a similar fashion, but instead of a fan you will get a wheel in an enclosed water basin. These machines are built to offer a similar experience to rowing and more often than not are also used by professional athletes. Magnetic rowers are a bit different because they use an adjustable electromagnetic brake to create resistance. 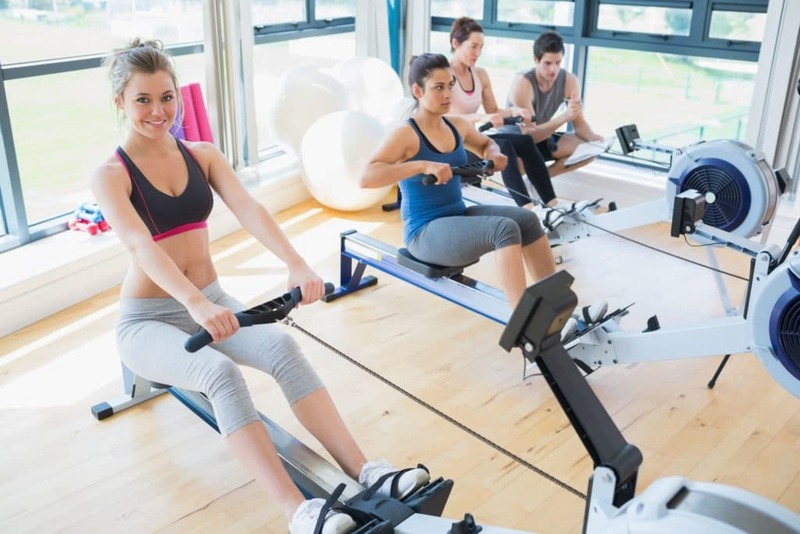 Often they are better suited for people without rowing experience as they tend to be less expensive and allow for users to set their resistance.